It has recently hit me that I am getting married in less than two months. This is, granted, still a very long time away, and I'm not exactly having a Wedstravaganza, but the engagement has been since, oh, forever ago it seems, so all of sudden it feels like time has actually passed and we will be getting married at some point which will be fun and then honeymoon which will be more fun and woohoo! My mother, unlike me, and thankfully, has not been in a state of delusion that everything will all just come together on its own, and so she has done a ton of work already for which I am very grateful. But yesterday I freaked out and was talking to everyone I knew (including office interns, who were very helpful in doing the math in figuring out how many drinks per hour per person) and going over what I had done and what I had not done and what was left to be done and gahgahgahgahgah....and came to the conclusion that there was basically nothing I could do. Sure, I can make a few calls, get the rehearsal dinner set to rights, confirm confirm confirm, and buy slippers for Dave and Toaster and RockNoodle. But the stuff that really needs to be done--like setting up chairs and tables, and laying out shells for the aisle 'o shells, and making the sangria, and getting my legs waxed--I can't do any of that now. So. I am coping with the stress of not being able to be proactive by playing a lot of Diablo II. I am regressing. I should knit. Knitting would be better. But El Long-Named Tunic is now kind of boring and shedding a whole lot of gross-looking yarn fuzz all over my desk. And it's not wedding-related. 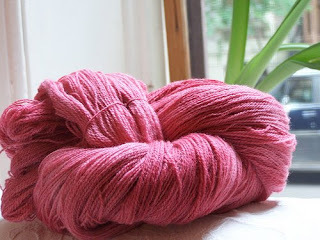 I want to knit some Perditas out of my leftover Laminaria yarn for RockNoodle and my sister Hannah (who are bridesmaids). But that requires sitting down and stringing beads and frankly I don't have the patience. The week after we got engaged I ordered Wedding Knits, but have not yet successfully knit anything from it. There are many things that I'd like to knit, and I've tried twice, but the Bridesmaid Wrap looked plain terrible, and the Belted Tunic Dress' gauge was horrifically off and I have not yet had the courage to pick it back up. Plus it looks like one long and boring knit. But I really ought to make something. That would be a knitting gesture toward wedding, right? (Laminaria clearly didn't quite cover it). I'm going to try the shorts and tank pajama set. Yep yep. I made Rhubarb again. And I don't think I used the same colors I did the last time I made Rhubarb. (This time I used two packets of strawberry/kiwi, one packet of strawberry, one packet of grape, and half a packet of tropical punch). I think Rhubarb might be an easy color to achieve, Kool-Aid-wise. Still, I like it. I love semi-solids, and I think this will look sweet as a shorts/tank set. And hopefully it will quell some of the "The sky is falling because I can't set up chairs!" angst.